Summer dresses are breaking out all over. You know the type - spaghetti straps, halter straps, no straps . . . dresses with a whole lot of shoulders and skin showing. I couldn't resist buying a spaghetti strap maxi dress recently. It was such a good price, great for hot weather and a plus for my upcoming trip to Aruba. But it was too long so I had to cut off the excess and hem the dress. This time instead of tossing the scraps into a bin I decided to make a funky, whimsical statement necklace out of a crazy mix of patterns and colors that complimented the dress pattern. I found a cute site that introduced me to Ficklesticks. They are really cute items that are made of fabric wrapped floral wire. 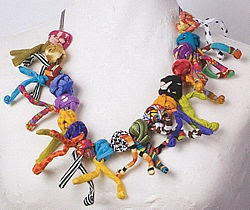 Granted, my necklace is not as colorful and whimsical as this and I also used chenille stems instead of floral wire but the message still comes out loud and clear of a necklace that's made with a crazy mix of colors, patterns and shapes which makes it so much fun and unique! Besides the dress scraps, I found some fat quarters in complimentary colors on sale at Hancock Fabrics for $1.25 each plus a 15% off total coupon - more than enough to get me started. And I already had chenille stems in my stash, a ruler, scissors, safety pin, needle-nose pliers and a sewing machine - so I was all set. Now you might be wondering how I'm putting this all together to make a necklace. Cut 1" wide strips of fabric . . .
With right sides together sew a 1/4" seam. Turn inside out using a safety pin pulled through the tube. Then wrap about an inch of two chenille stems together to lengthen for necklace. Bend ends of chenille stems over so they don't poke the fabric and insert into the fabric tube. Push the fabric together making sure the ends of the chenille stems are at the ends of the fabric tube. Using needle-nose pliers, turn a small section of end over twice and press together. For the decorative hanging necklace pieces, that I call squiggle stems, insert a single chenille into sewn fabric tube, pushing fabric together and finishing ends as before. Make a loop with the squiggle stem and drape over the center necklace portion. Push both ends through the loop, and tighten. After trying out several different squiggle stems, I opted to use just five pieces . . . curling the ends around in a circle. But that's the cuteness of making this whimsical necklace. You can make so many different variations with the bendable fabric covered chenille stems. And finally, I made a bracelet with the left over squiggle stems . . .
And here it is with the dress . . .
What a fun summer project! And it's a perfect go to necklace to wear with those cute summer dresses, tops or outfits! That's a fun piece, Gail! I really like the bracelet. Cute! This is great! I like yours even better than the inspiration piece. Just came over from Carolyn's Homework, and appreciate the well-explained tutorial. Thanks! What a fun and funky piece Gail. It looks so pretty with your dress. Aruba? Lucky you!! This is so different and fun! Thanks for linking up! So interesting and unique! Thanks so much for taking the time to link up with us over at the #HomeMattersParty - we hope to see you again on Friday! this is so clever!! I love it! thanks for sharing on our Bowdabra Saturday Crafty Showcase!!! so cute, so easy and the endless possibilities for rationalization! I haven't seen a fabric covered chenille stem necklace before but you may have started a new trend! I just love how creative this is and I have to say it looks spectacular with the outfit! Thanks for sharing the How-To! Your creativity is boundless, Gail! This necklace is such a unique fashion piece! What a creative piece! You have the best projects. This will be a fun piece to wear with a sundress. At first I did not take to it, but then with the bracelet I thought with the right summer outfit it would look good. Then you provided the perfect little outfit that complimented and all went together. - lovely.